Friday, March 23, 2018, at the New Horizons Care Center in Lovell, Wyo. 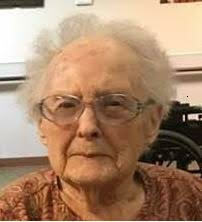 She was born aug. 29, 1924, in Xenia, Ohio to Thomas and Helen McClelland. In her early life, she helped her father by working at his gas station in Xenia. a loving mother of three. Over the years, she enjoyed singing in the Choir, and playing the Piano for the United Methodist Church. She was an avid reader and enjoyed crossword puzzles. No matter life's hurdles, she always remained strong in her faith in Christ. four grandchildren and several great-grandchildren. grandson Dustin Glenn and daughter Theresa H Glenn. Memorial services will be held Saturday April 14, at 10:00 at the First United Methodist Church in Powell.